I’d never read anything written by Gary McMahon; in fact, I hadn’t heard of him before I saw this chapbook. However, the cover blurb by Tim Lebbon immediately grabbed my attention since I’m familiar with his work. I can’t really say that I had much in the way of expectations going into this one, but I did hope for a decent read. Rob and Becky are renovating an old house. Not a home, but a house. Though they live under the same roof, Rob and Becky are worlds apart. Since the loss of their son they seem to have gone their separate ways. During the renovations, they discover a hidden room—the Quiet Room. The room is aptly named, as there is no sound in the room—none at all. But there are other things in there. Things that may bring Rob and Becky back together…or to the brink of madness. I was pleasantly surprised by the quality of writing this diminutive book. Weighing in at only 22 pages, it makes for a quick read. It was a good read—not necessarily a fun one—because the author does a tremendous job at capturing the overwhelming sense of loss and despair of Rob and Becky. 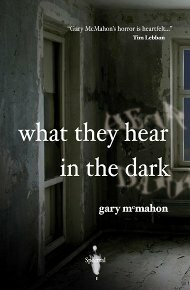 I recommend What They Hear in the Dark if you want to be introduced to McMahon’s polished, atmospheric writing. Just be careful if you’re reading it on a dreary day, because that’s exactly the mood in this one. This is the debut chapbook from Spectral Press, whose mission is to “be devoted to presenting single-story chapbooks, in the ghostly/supernatural vein, in a high-quality but very classic format. Each will be in strictly limited quantities of 100 only, signed and numbered by the author.” Based on this initial release, it looks like there are good things to come from them.